Flapjacks pattern is 86 x 98 inches. It has clear directions printed in black and white along with a color front printed on cardstock paper. Pattern is held together with a metal brad paper fastener instead of a plastic bag. 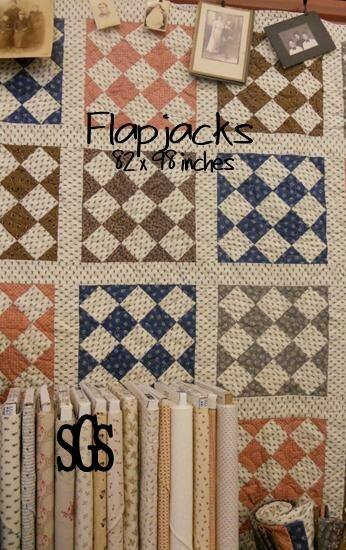 Flapjacks pattern uses civil war prints and background. This is a good quilt to show off a shirting print, small ditzy print, or use a muslin, white on white, or tonal and show off a grouping of darker prints.